Over the weekend I had some time to try and see if I could get the cheap DVB-T usb dongle to work as a remote SDR using the Raspberry Pi as the server, using the tools from RTL-SDR it really isn’t that hard. On the Raspberry Pi I was using the latest version of Raspbain and also had turbo mode switched on. Once its completed and you’ve restarted the Raspberry Pi if you do “rtl_tcp -a 192.168.1.88” the IP address should be the one assigned to your Raspberry Pi so you’ll probably need to change it! as long as you get no errors your now ready to connect to the RTL_TCP server from another application I’m going to use SDR# but they are other applications available for Linux. SDR# is easy to use I’d recommend you download the nightly build as it has all the latest features, then its just a matter of selecting RTL-SDR / TCP and filling out the IP information to match the Raspberry Pi and clicking Play! you can now use SDR# normally. 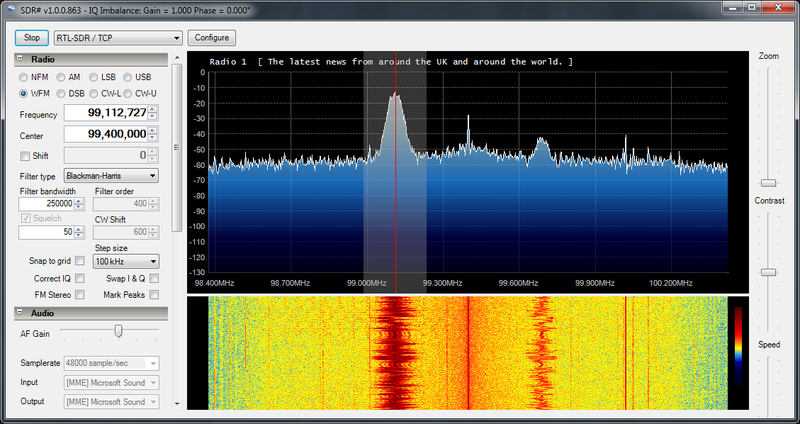 Between my Desktop and Laptop I’ve been listening a lot to broadcast FM (mostly Radio 1) and Airband for Oxford London Airport and Heathrow without any issues whats so ever. hi! we build a new wiki on our noncommercial site for rtl-sdr. would it be ok for you that we use your manual about in our wiki ? Nice, did you also try this with a FUNcube dongle? I haven’t yet but I believe it should work OK. Various requests to the FunCube Dongle group have not found an answer to this yet. I guess the code needs changing to avoid this call which might be compromised because the R-Pi doesnt have an RTC. ps was at you talk at the RSGB symposium yesterday on the floor at the front asking you about backups! New to Linux but following your instructions to see if I can get this working.. I get bash: cmake: command not found..
as its moaning that cmake isn’t installed. No problem Philip, what sort of errors you getting? will try help best I can. I’m going to start again tomorrow with a new Raspbien image incase I broke something.. Always a good thing todo Philip, shout if you do need some help though. Not had chance to start again today but before I do, can I just double check with you a couple of things..
Also, do I need to have the RTL dongle plugged in during the install? Shouldn’t need anything else installed bar what I said on the post, would recommend not having the RTL plugged in till you’ve finished everything. Nice is there an image somewhere with evertthing already set up? Seeding a torrent of this should be appreciated! Finaly got it going and thanks for your instructions and patience.. I was getting some install problems whilst using the GUI after Startx but went through the procedure again from just the startup command prompt and all went like clock work.. Always a problem when you don’t know what your doing but got there in the end.. Excellent tutorial. I just follows the step from a remote shell. I can not wait to connect my new dongle.. Thanks Enrico, pleased you found the guide useful! I have the same tdt you and I would also like to hear hf. What would be the leg that should in my tdt welding? Advanced thank you very much! Hi Pete, Got a R-Pi for Christmas, now looking for an application – probably radio oriented. They are great for radio, let me know if you need any help. Tnx in advance and keep the nice work. Same here, it works on the PC no problem, with Zadigs driver, sdr# adsb#, virtual radar etc. I am at ease with anything windows, but linux is new to me. Where do you get the DVB-T dongles and which one would you recommend? At the risk of asking a silly question, any chance you think I might be able to use your install procedure to use my RPi with my Ensemble RXTX SDR? I do not have a DVB-T usb dongle. I have the Ensemble and a Soundblaster MP3 external sound card. Might I somehow adapt SDR# to speak to the Ensemble? Thoughts? Thanks for a great post and thread. Very helpful. If you are looking for 8GB worth of WEB space, if you contact me I can provide you with an account to upload to and I’ll give you the URL to publicise where the image can be down loaded from on one of our high speed WEB servers. You’ll find an email address if you look my call sign up on QRZ.COM. I would love to give this a try on my Pi, but I’m far from a Linux expert and the idea of an image of your already setup and working SD card would help me (and I am sure others too) enormously! Thanks for the offer. Since writing the blog post I bought online another server for work that can cope with the SD images, I’ve just been lacking time to actually sort it out! I’ll try to get it done over the weekend if possible, I might be able to redo them on the standard 2gb iso which would make downloading a lot quicker. Did you ever make an image file available for this? Would like to give it a try. I did make one but didn’t publicly distribute it, best bets to set it up on a fresh pi install. Peter, thanks for your instructions on using Rpi as an RTL_TCP webserver. Works great over home network but I cannot get it to work over public network. Error is “unable to connect”. I have opened ports through the router and the Windows Firewall but to now avail. Jan, interesting my only guess is that its networking related with the router but there should be no reason for it not to work. If you have a network address translation from outside to inside configured, this is going to work. You should keep in mind that you need an internet bandwidth of 40Mb upload and if you want to use the full 2Mb sample rate. A ssh tunnel wil also work, so if you have a ssh connection to you internal network you can configure a ssh tunnel to connect to the rtl_tcp session. But again, do you have enough upload bandwidth. Have you considered adding a Ham It Up v1.0 – RF Upconverter for HF bands? Also, that add-on will reverse the process and convert an input between 100-150MHz to a HF signal for a transmit side on HF – perhaps the making of a HF/VHF/UHF transceiver? Not sure what Linux app could manage it. No I haven’t main reason being that I’ve the Funcube Dongle Pro Plus that includes HF, so never really required the function. Earlier on I configured port 1234 to port 1234 on LAN. SSH over the internet to RPI works fine. Netstat on RPI shows that no connection to port 1234 on RPI. SDR# is set to my static IP address as well.. bit of a mystery… Are there any firewalls in the RPI that could block traffic? i am a Linux Newbee and looking for a solution that makes rtl_tcp starts automatic when the Raspberry is starting up. Successfully installed everything and my RasPi started receiving with the USB SDR. Note: Before you do anything remember to sudo apt-get update. My install for git failed because I didnt do the above step. I also found that cmake, pkg-config, libusb1.0 worked best by doing separate installs. I connected to my RasPi through my local network with my Samsung GII with SDR Touch installed and worked brilliantly. Thanks for the great How-To. All well on my raspberry 3 Wifi for everything, very impressed that so much works straight out of the tin. Alas rtl_tcp -a 192.168.1.19 just states no supported devices found. The device is a Funcube Pro. Any ideas? I’d expect it to error as its not designed to work with the Funcube Dongle. 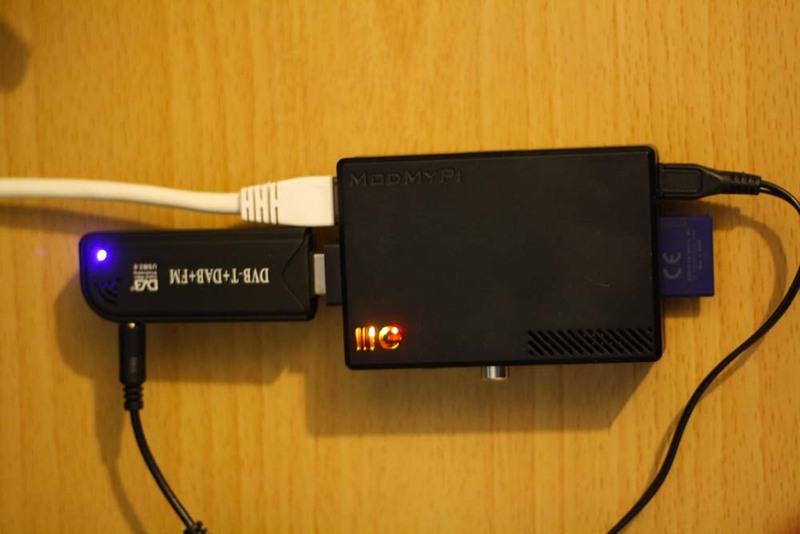 Excellent tutorial… I, too, am a “newbie” to Linux and RPi and RTL-SDR+UpConverter. 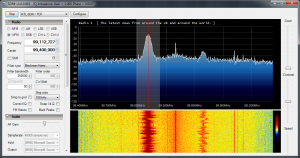 My question is: Has anyone experienced a REDUCTION in standard FM broadcast signal strength of rtl_tcp to SDR Sharp on Win10 laptop over local LAN route vs. directly connected RTL-SDR+UpConverter USB cable to same Win10 laptop running SDR Sharp? Can’t say I have noticed Bob although it might happen. 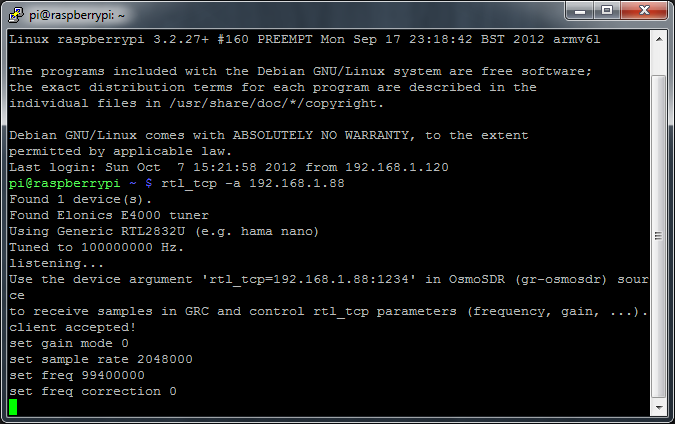 Fantastic tutorial, I have followed the steps and I am able to tcp the SDR# signal into the raspberry PI. My question is, are you then able to record that audio and save it as a .wav file ?